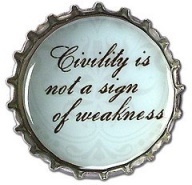 I often have conversations with people about how society has lost it’s courtesy and civility. It often leads to discussions of entitlement and how our youth today, don’t seem to have the understanding of manners and decorum that once used to be taught in school and practiced at home. Then, you sit by the young gentleman in a small plane who gets up and assists you to your seat and starts polite conversation and you realize that all is not lost in the world of polite society. When instructed to turn off all electronics, he did so promptly and stowed it in his carry-on. He indicated he was a university student travelling to visit some friends for a weekend party. If he had of told me that first, I would have judged him as one of those youth that I often talk about with my adult cohorts. I was impressed with his ability to manage conversation, make eye contact and use the most impeccable manners throughout the flight. I didn’t point out the impression he made on me for fear of embarrassing him but I want to pass it on – especially to young people out there – manners and courtesy are never out of style. Make courtesy a habit. You never know who you are going to impress with it. That’s a great experience, thanks for sharing. It often catches me off guard when I come across young people like the young man in your blog. It’s a shame that courtesy and manners are becoming so rare, that we are surprised by it.